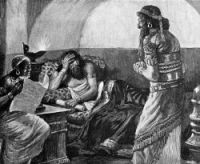 The King Ahasuerus who appears in the Book of Esther, is most probably Xerxes of history, and this conclusion is fortified by the resemblance of character and by certain chronological indications, the accounts of his life and character agreeing with the Book of Esther. In the third year of his reign, Ahasuerus held a great feast and assembly in Shushan the palace following a council held to consider the invasion of Greece. He ordered his queen Vashti to be brought out, to show the people her beauty. On her refusal to violate her modesty, he divorced her. Four years afterwards, he married Esther, the cousin and ward of Mordecai. 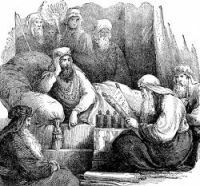 Five months after this, Haman, one of his counsellors, having been slighted by Mordecai, prevailed upon the king to order the destruction of all the Jews in the empire. But before the day appointed for the massacre, Esther and Mordecai induced the king to put Haman to death, and to give the Jews the right of self-defense. On this page you'll find some pictures of King Ahasuerus taken from my collection of antique Bibles and story books. You're welcomed to use these King Ahasuerus pictures in your art projects. Click on the illustrations below to see more details about saving a free image or about purchasing the images of King Ahasuerus at a higher resolution.